Michel-Ofik Nzege made early in-roads. Leeds Force crashed out of the BBL Cup at the first hurdle, suffering a resounding 103-54 defeat away to London Lions in the capital, writes SEB GIGNER. A brief third-quarter revival wasn’t enough for Force to overcome a cavernous half-time deficit, as London roared into the quarter-finals and crushed Leeds’ hopes of cup glory. An impressive opening saw Force race into an early advantage against the high-flying Lions, with Michel-Ofik Nzege converting a sensational solo shot after 20 seconds. Momentum quickly shifted in London’s favour however, as the home side showcased their endless offensive flair with 14 points unanswered with Leeds being dealt blow after blow in the first quarter. 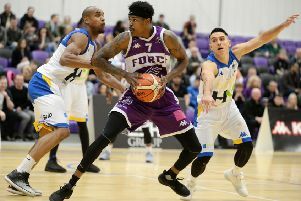 London continued to execute a ruthless basketball lesson in front of Force, rallying behind an electric Momcilo Latinovic who caught fire and decimated Leeds with a 15-point explosion in the opening 10 minutes. Skipper Samuel Toluwase dropped a thunderous dunk, followed up by Tavarion Nix charging to the rim with a forceful rejection of Robinson’s lay-up to awaken a dreary Force. Former Force threat Jack Isenbarger – who led the league in three-point percentage last campaign – countered Leeds’ sudden surge with an all-too-familiar triple. With the threat of an opening-night repeat looming, the tenacious Force continued to battle back. Lethal long-range menace Ingus Bankevics drilled back-to-back threes to hand Leeds the initiative heading into half-time. Despite inaugural All Stars Championship MVP Justin Robinson beginning to heat up, Force chipped away at London’s towering 35-point lead in the third period and fought toe-to-toe in the capital. Wanliss’ six-point salvo, a marvellous spinning finish from Eric Childress and a pair of three-point plays from Nzege and Toluwase restored some pride for Force – as Leeds impressively topped the Lions 20-18 in the penultimate ten-minute segment. Order was soon restored in the final quarter, as fatigue once again played a part in Leeds’ late-game demise. A meagre 13-point performance in the fourth saw a fading Force scythed apart by the rampaging Lions, who poured on points and cruised to a comfortable win as Leeds’ cup exit was confirmed.